Alvin CFB1216 - Clear Front Mesh Bag 12" x 16"
Alvin Clear Front Mesh Bag 12"x 16"
Introducing a crystal-clear vinyl front to make identifying bag contents a snap. The back features the classic, see-through vinyl reinforced with mesh webbing for strength. These durable, 300 micron thick, bags are ideal for organizing and protecting drawing and drafting supplies or keeping artwork and documents safe! Bags come with a ¾" wide gusset and a gray zippered top. 12" x 16". 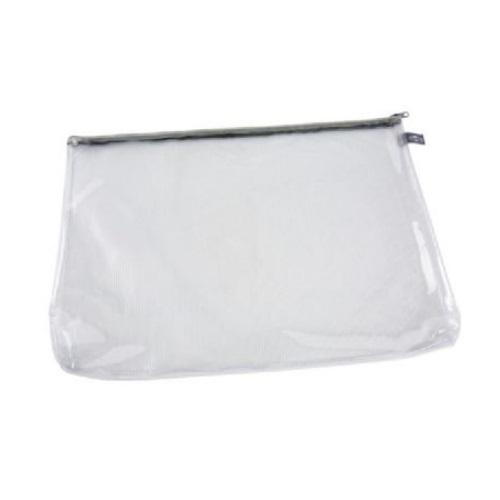 Alvin CFB1013 - Clear Front Mesh Bag 10" x 13"
Alvin CFB513 - Clear Front Mesh Bag 5" x 13"